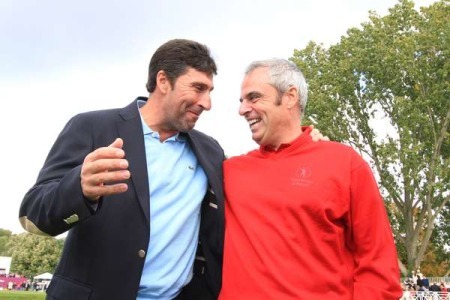 Jose Maria Olazabal and Paul McGinley on the final day of the Vivendi Seve Trophy in Paris last year. 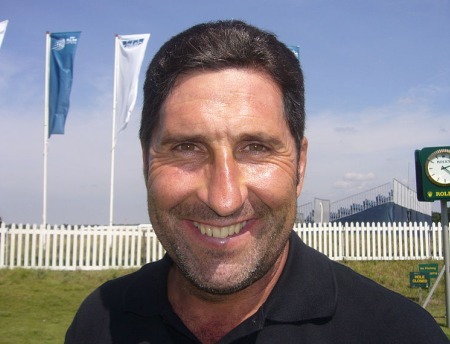 Olazabal says he will not be naming his vice captains until the spring. Photo Jenny Matthews/www.golffile.ieJosé María Olazábal spoke to the Spanish sports daily Marca about his preparations for this year’s Ryder Cup at Medinah. He shares his thoughts with Gerardo Riquelme with just nine months to go before the sides meet in Chicago. Does the Ryder Cup bring a lot of headaches? Headaches? I wouldn’t put it that way. There are lots of meetings, lots of decisions to be taken, but that’s part of the job. I knew what to expect when I accepted it. What kind of decisions? There are still nine months to go? Ha, ha. It’s not as if they show you a few samples and you say, pim, pam, that’s it. You have to see all the options. We’ve chosen an Italian brand because it is one of the Ryder Cup sponsors and we liked it. Have you spoken to any possible vice captains? I will do so later on. There’s plenty of time and I will take that decision as near to the matches as possible. It won’t be two weeks before but it will be around spring time. There will be no announcement whatsoever in the next few weeks. Given how busy you are right now, it doesn’t leave you much time for practice. Look, its true that there are lots of meetings and travelling involved but there’s time for everything. My plan is to continue competing in as many tournaments as possible to be close to the boys and exchange views. That’s why I’m ging to South Africa on the 15th and then I will be in the Emirates. Many of your players have opted to combine the European Tour with the US Tour. Could that prove to be a handicap? I din’t believe so. It’s a global world and it’s logical that this happens. And the qualifying criteria are clear: five from the world rankings and five from the European money list. The ten who qualify for the Ryder Cup team will be the best ten. Both yourself and your opposite number Davis Love, the two captains, are tranquil but popular figures. Will that lead to less tension during the competition? I’m sure that when the Ryder Cup starts the atmosphere will be lively and full of tension and emotion. They are going to try and win back the Ryder Cup at all costs. They were very well prepared at Valhalla four years ago and will be again this time. It’s also being played in Chicago, a city that fought unsuccessfuly for the Olympic Games and the Superbowl. I was there in October and everyone in the city understands that the Ryder Cup is their Olympic Games. You are joining Seve and Langer on the list of non-British captains of the European side. What does this mean? Satisfaction and pride, especially when one considers who has chosen you. It’s your peers who are saying: we believe in you. It is a sign of respect for the way you have acted throughout your career. Yes but it’s also a bit of a tough one because nobody wants to be captain in the US. [Laughing] It’s not ideal. I’m not going to deny that I’d have liked to be captain on European soil with everything in my favour. Who wouldn’t? But someone had to be captain! It’s difficult because I am sure they will set up the course the way they would like it. But Langer and others have done it [won in the US] so we have to follow their lead. Three Spaniards are currently inside the automatic qualifiers for your team - Sergio Garcia, Álvaro Quirós and Gonzalo Fernández-Castaño. Will the fact that they are countrymen have positive or negative influence in the event that need a captain’s pick? That’s not going to be a factor. When it comes to my two picks, many things will be taken into consideration. I will look at who is in form, which player is better adapted to matchplay and who, for their character, is best suited to the situation we are going to find outselves in. If it comes to that, and if I believe it’s for the best, the Spanish players will have their options. Criticism doesn’t bother me. But I believe that if they play at the level they showed at the end of last season, they will be there. The Ryder Cup is about co-existence. Will you consult people like your friend [Barcelona coach Pep] Guardiola on matters such as group management? No, I haven’t spoken to anyone. I don’t rule it out but as I haven’t done it so far all I can say is we’ll see. History says that no European has gone on to win a tournament (on the main tours) after serving as Ryder Cup captain. Is that a challenge? Winning is always a challenge. It’s something I have thought about and yes, it’s a big motivating factor. But when you think how difficult it already is to win, it can’t make it any more difficult. José Maria Olazábal, the 2012 European Ryder Cup Captain. ©Getty ImagesPadraig Harrington, Justin Rose and Luke Donald probably wish it had happened five months ago. European Ryder Cup captain Jose Maria Olazábal got his wish and has just two wildcards for the matches at Medinah next year. 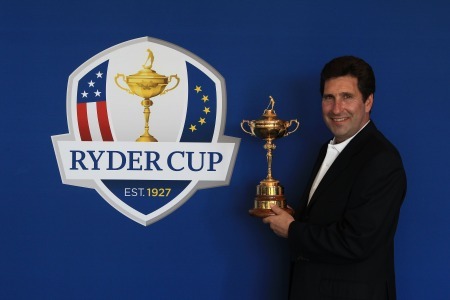 Jose Maria Olazabal will delay naming his Ryder Cup picks until the Monday after the Johnnie Walker at Gleneagles. Picture ©Getty ImagesJosé Maria Olazábal kick-started Ryder Cup year by revealing that he would announce his two captain’s picks on the Monday following the Johnnie Walker Championship at Gleneagles, the European Tour writes. 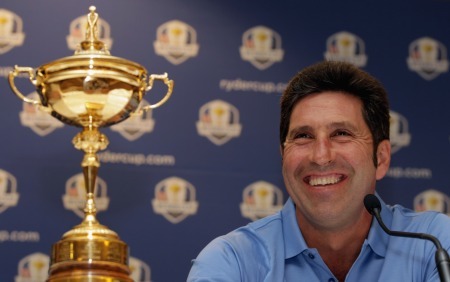 Jose Maria Olazabal.©Getty ImagesEuropean Ryder Cup skipper José María Olazábal does not believe that Tiger Woods is finished as a major competitor.